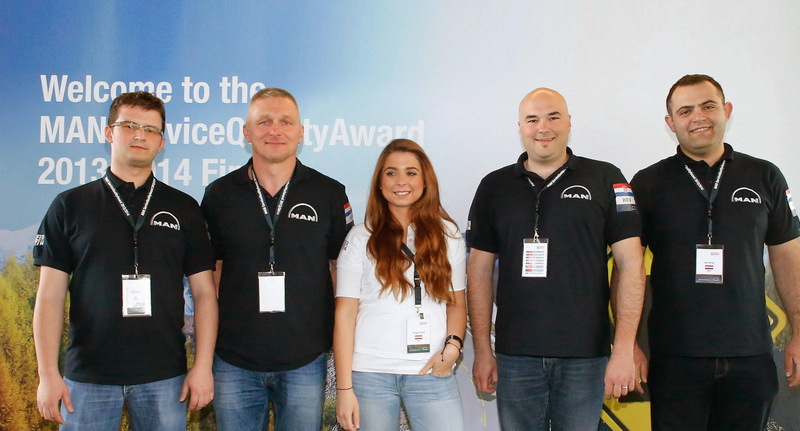 The winners of the MAN Service Quality Award for 2014 come from Croatia. Two teams from Germany were very close behind. The Auto Hrvatska PSC Slavonski Brod service centre located in Croatia overcame the competition to win the title of “Best MAN Workshop 2013/2014” in the final of the MAN Service Quality Award that took place in Berlin on 9 April. In second place was the MAN Truck & Bus service centre in Rosenheim, with Andreas Tröger GmbH, a MAN partner workshop based in Saalfeld, finishing third. The winners came out top against 800 workshops from around the world. As part of the competition, workshops were required to demonstrate their knowledge of vehicle technology online over several rounds. In January 2014, the best 83 workshops were put to the test by DEKRA with a simulated customer call. This was intended to assess customer service and professional expertise. In April, the best workshops from each region travelled to Berlin for the final. The finalists came from Croatia, Germany, Austria, Belgium, the Netherlands, the United Arab Emirates, Russia, Turkey, Poland, Qatar, Spain, France and Estonia. In the final, judges had 20 minutes at each station to assess participants' specialist knowledge of original parts, customer management, service agreements and warranties. In addition to this, the judges also had 40 minutes to evaluate their skills in rapid problem-solving on trucks, buses and engines at the practical stations. The Service Quality Award has been presented by MAN to the best team since 2008. This year, 60 percent of all MAN workshops registered worldwide for the competition, which represents a new record number of participants.